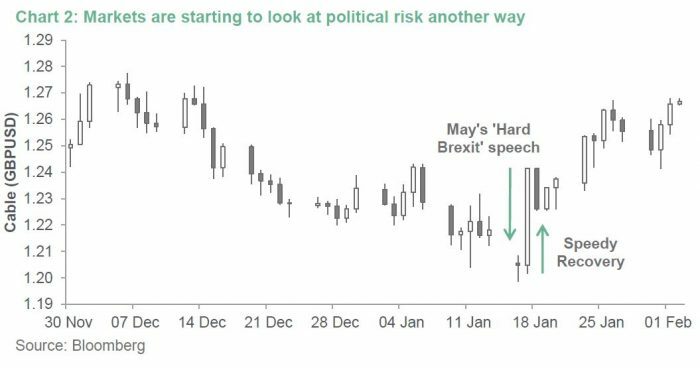 So far, the new reign of political populism has been embraced by markets with risk assets rallying sharply in the wake of unexpected upsets like ‘Brexit’, Trump and the Italian Referendum. The outcome of the latter barely registered as a blip on the bulls’ radar, despite being touted as one of major possible left-tail event risks in the lead-up to the vote. This underscores the idea that markets may be incorrectly pricing downside political risks as they seemingly embrace the unknown. This was also exemplified by the reaction to one of the major market-moving events during January. This was not a comment from Yellen, or what has traditionally been the most important piece of economic data, US Non-Farm Payrolls. Rather, it was the ‘Hard Brexit’ speech delivered by the recently-inducted British PM Theresa May. After an initial drop, the GBP/USD’s ensuing recovery was the largest intraday percentage change in any major currency pair for the month (3.1%).